Note: To see a map of this data, click here. To see how you personally would fare, use our online calculator. With just five months to go until the largest tax increase since World War II, a.k.a. “Taxmageddon,” some people are becoming concerned about the impact it will have on the economy. This week, the House will vote on a Republican proposal to extend through 2013 the Bush tax cuts of 2001 and 2003 and the Alternative Minimum Tax (AMT) patch, two of the largest components of Taxmageddon. The larger of these is actually the AMT patch, which would save middle- and high-income taxpayers about $193 billion, according to the Joint Committee on Taxation (JCT). 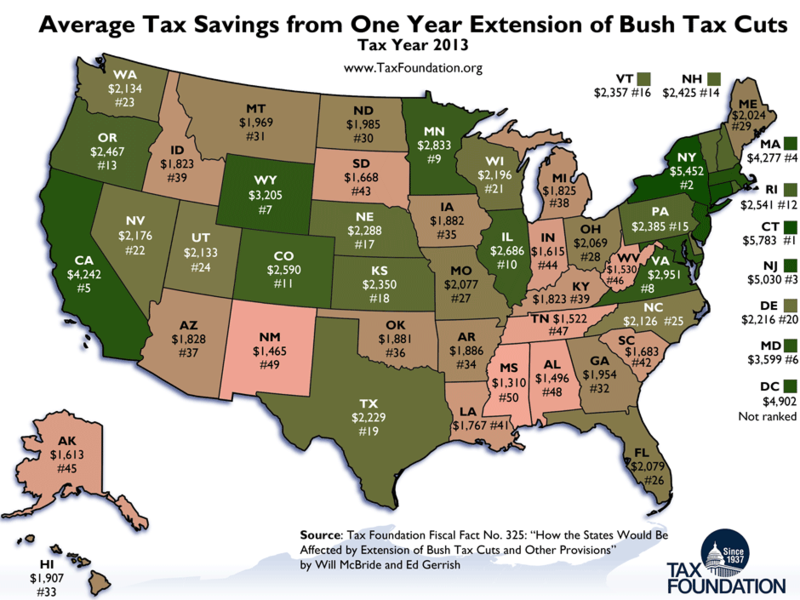 Extension of the Bush tax cuts, which are more evenly distributed, would save taxpayers about $179 billion. The bill also extends estate and gift tax provisions for one year, saving taxpayers $31 billion, and small business expensing, worth $581 million. The total tax relief is estimated at $403 billion, or about 2.7 percent of the economy, and almost all of it would be immediately felt in 2013. As such, it would forestall many of the economy-crushing aspects of Taxmageddon, while setting the stage for comprehensive tax reform next year. All 50 states would benefit from this bill, though some more than others. Table 1 shows our estimates of the tax relief for each state, based on the latest IRS data on the distribution of income, tax credits, and deductions within each state. The first column is total aggregate tax relief in millions of dollars, the next column is tax relief as a share of state income (AGI), and the last column is tax relief per tax filer. Generally, high-income states would receive the largest tax relief, because they pay the most taxes under our extremely progressive federal income tax code. They are also the states most affected by the AMT. New York, for instance, would save about $51 billion in taxes, or 8.05 percent of income, if these tax cuts were extended, including the AMT patch. That amounts to $5,452 per tax filer. More than half of that (62 percent) is due to the AMT patch. California would save about $71 billion in taxes, or 6.89 percent of income, if all tax cuts were extended. That amounts to $4,242 per tax filer. Again, more than half of that (60 percent) is due to the AMT patch. At the other end of the spectrum, Mississippi would save about $1.7 billion in taxes, or 3.15 percent of income, if all tax cuts were extended. That is $1,310 per filer. Less than one-third (28 percent) of that is due to the AMT patch. Tennessee would save about $4.4 billion in taxes, which is 3.21 percent of income or $1,533 per tax filer. Only about one-quarter of that is due to the AMT patch. The table below shows each of the provisions scored by the JCT, and the rule we used to apportion the tax relief to the states. Most provisions can be directly tied to those who have taken them in the past in each state, based on IRS returns from 2010, such as the AMT and the child credit. However, the apportionment of the provisions related to the brackets is more error prone, due to the wide income intervals the IRS provides at the state level. For instance, the IRS provides data on those earning between $200,000 and $500,000, but the top rate applies to taxable income of $388,350 or more. As such, we estimated the share of income taxed at various rates based on the latest IRS data. To all filers with positive AGI. 2/3rds to filers earning more than $50,000, 1/3rd to filers earning more than $100,000. 1/2 to filers earning more than $200,000, 1/2 to filers earning more than $500,000. To all filers earning more than $200,000. To all filers taking the child credit, according to income. To all joint filers, according to income. To all filers taking the tuition and fees deduction, according to income. To all filers taking the dependent care tax credit, according to income. To all filers taking the adoption credit, according to income. To all filers reporting capital gains, according to income. To all filers reporting dividends, according to income. To all filers earning more than $500,000. To all filers reporting business income, according to income. To all filers who pay the AMT, according to income. William McBride, Taxmageddon Looms, Potentially Pushing Tax Freedom Day Later than Ever, Tax Foundation Fiscal Fact No. 297 (Apr. 16, 2012), https://taxfoundation.org/article/taxmageddon-looms-potentially-pushing-tax-freedom-day-later-ever. Douglas Holtz-Eakin & Ike Brannon, American Action Forum, New Study Examines Economic Effects of the Fiscal Cliff (July 17, 2012), http://americanactionforum.org/topic/new-study-examines-economic-effects-fiscal-cliff. House of Representatives, Committee on Ways and Means, Democrats’ Ticking Time Bomb, Part I, June 11, 2012, http://waysandmeans.house.gov/News/DocumentSingle.aspx?DocumentID=299226. Joint Committee on Taxation, Estimated Revenue Effects of H.R. 8, The “Job Protection and Recession Prevention Act of 2012” (July 24, 2012), https://www.jct.gov/publications.html?func=download&id=4476&chk=4476&no_html=1. Internal Revenue Service, SOI Tax Stats – Historic Table 2, http://www.irs.gov/taxstats/article/0,,id=171535,00.html. William McBride, CBO Report Shows Increasing Redistribution in the Tax Code Despite No Long-term Trend in Income Inequality, Tax Foundation Fiscal Fact No. 322 (July 24, 2012), https://taxfoundation.org/article/cbo-report-shows-increasing-redistribution-tax-code-despite-no-long-term-trend-income-inequality.